Hey, who else is shocked that it’s May next month? That’s also what’s freaking me out. We moved to our new place officially in December, and almost five months have blown by? I guess that shows how seriously romanced I’ve been by this city and our home. Between the two, sitting at my computer for more than what’s necessary for work is hard to do. Rich sauce for the lasagne, easily made vegan with some soy crumbles. Another great thing is that I’m running again! Remember that sad, self-pitying post I wrote just about a year ago about how I was going to have to hang up my running shoes? Oh no. The power of Meetup, Santa Barbara and some pretty awesome people have changed all that. Granted, I’m having a few IT band issues after about eight miles, but overall, I’m doing awesome. I even ran a half marathon this weekend—and beat my own record I set about three years ago! So thank you, Santa Barbara Striders, for helping me get my groove back, and most of all for the friendship! So I guess that running 18-23 miles a week means that I can chow down on some lasagne, right? But Jenn, you can’t have gluten! How can you make lasagne? You’re right on the first, but wrong on the second. 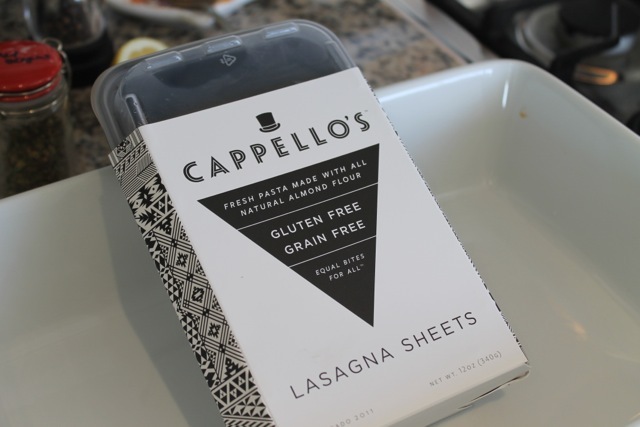 Thanks to a fantastic company called Cappello’s, I can make my lasagne and eat it too. Another reason it took me so long to even make this pumpkin lasagne—that I’ve wanted to make since pumpkins were in season seven or eight months ago—was that I wanted to wait til we got settled in the house before I ordered the Cappellos products. Colorado has some clever food people. If I didn’t love SB so much, I’d move there. Even with the snow. Because frankly, between Mulay’s sausage and Cappello’s, Colorado rocks! The kind and wonderful geniuses at Cappello’s have made pasta out of almond flour. Whaaaat? Oh yeah. And it is wonderful. The best thing is is that the fettuccine cooks in 45 whole seconds. Booyah. Their other two products are gnocchi and lasagne sheets, and their packaging is beautiful. 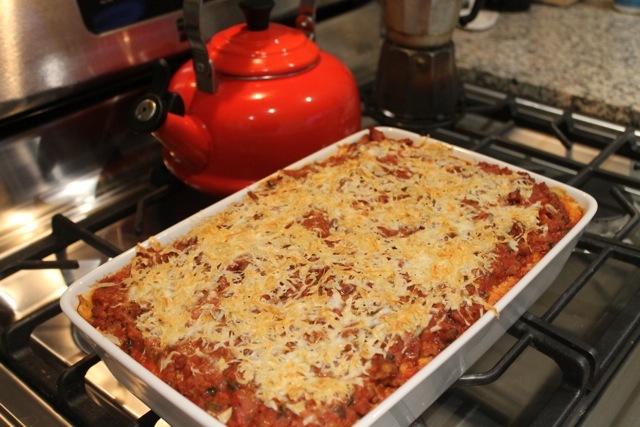 Once that cool package arrived (a cooler with dry ice packs), I couldn’t wait to make this lasagne, which I cobbled together from several recipes and the strange parts of my mind that like to put ingredients together. And this is what happened. Raw vegan ricotta. It is just too delicious! I love the fact that this can SO easily be made vegetarian/vegan! Sub that sausage out for veggie crumbles and omit the bacon, and you’re all set. 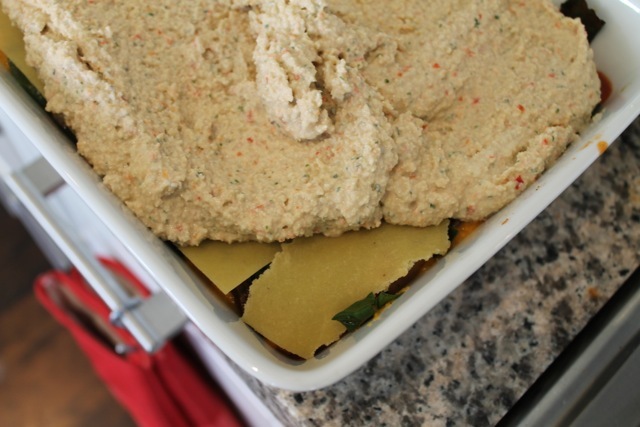 And the raw ricotta makes a truck load, so be prepared to use it in other dishes. I think it would make great stuffed shells, but my vegan friends put it on sandwiches. I personally ate at least a cup with a spoon. Don’t wait until pumpkins are in season. Do what I did and substitute butternut squash. You’ll be happy you did! 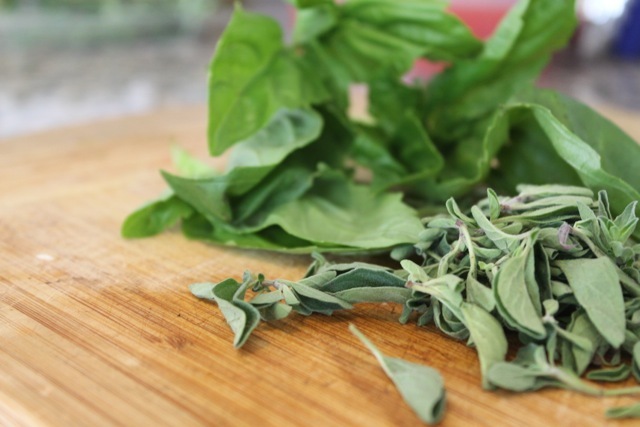 Fresh herbs I am trying to grow in my garden. Basil is not cooperating. 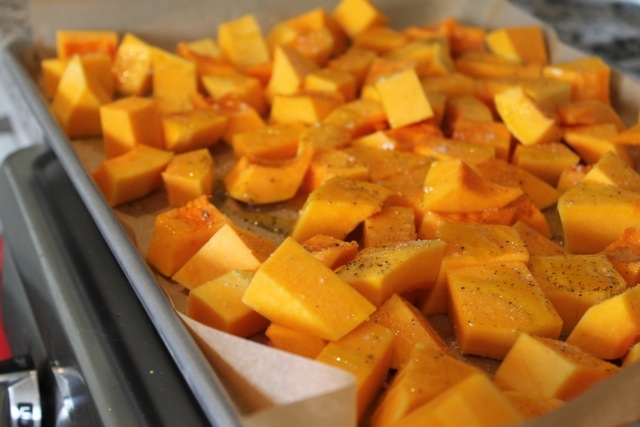 First prep the pumpkin or squash by peeling it and chopping into 1-inch square cubes. Coat with olive oil, sea salt and freshly ground black pepper and roast in a 400°F oven until soft. Let cool and purée, set aside. Butternut squash or pumpkin will work just fine for this recipe. Saute the onions in a healthy dose of olive oil over medium heat until they are softened. Add garlic, cook for three more minutes. Remove sausage from casings and add to onions and garlic. Break up and cook until browned. 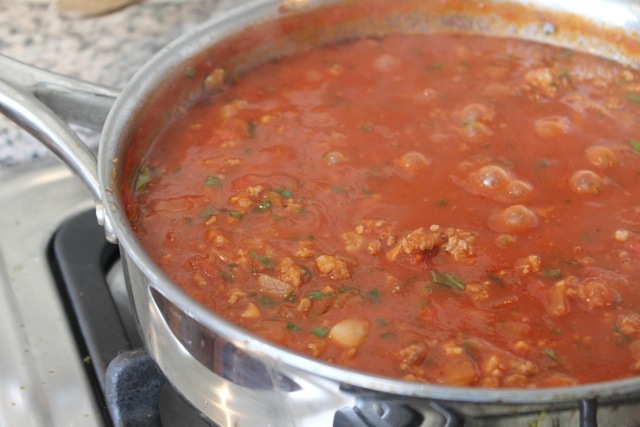 Add tomatoes and herbs; cook for at least an hour for the flavors to blend and the sauce to reduce a bit. Taste and add salt and pepper to taste. Let cool. Sautée the chard until just wilted. 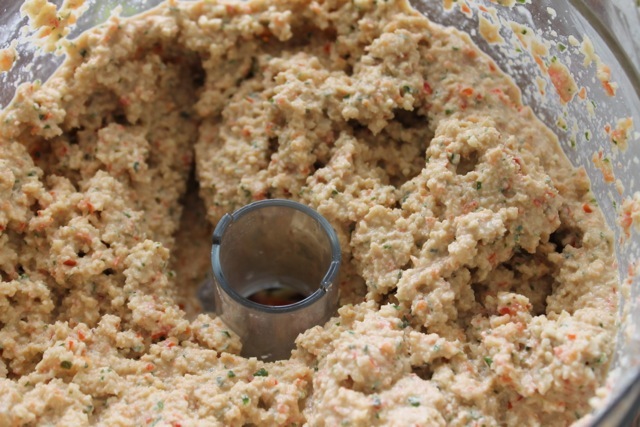 In a food processor with the metal blade, process the following until smooth: red pepper, 1/4 cup water, 1/4 cup lemon juice, herbs, nutritional yeast, garlic and 2 tsp salt. Add half the soaked cashews and process until almost smooth, scraping down the sides once or twice as necessary during the process. In a high-speed blender, combine the remaining cashews, water, lemon juice and salt. 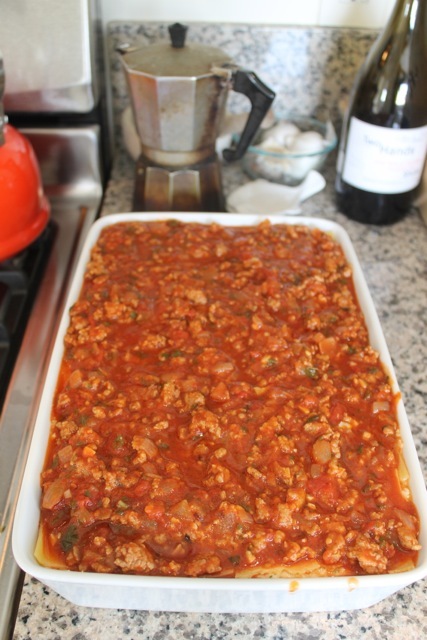 Blend on high until smooth and creamy; add to red pepper mixture and fold gently, using a rubber spatula. 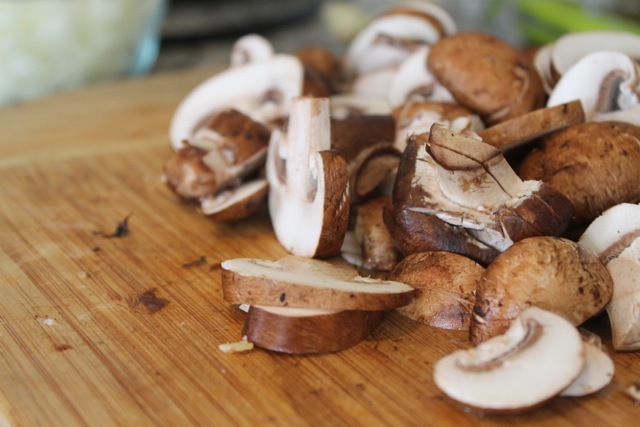 Either use immediately or it can be stored in the fridge for up to four days. There’s a lot of this stuff, so you’ll have leftovers. Render the bacon in a frying pan until almost crispy. 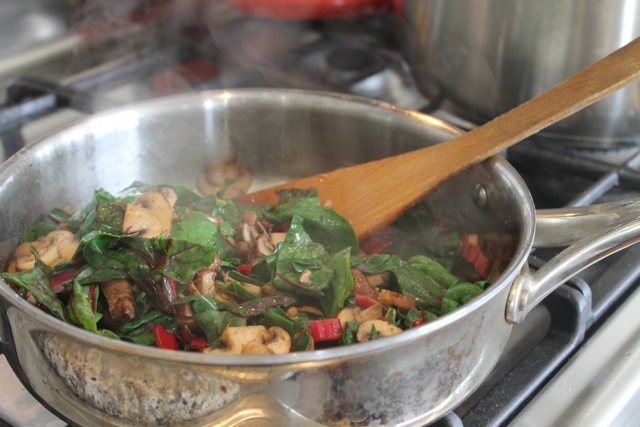 Add the mushrooms and garlic and cook until softened, then add the chard. Cook until the chard is wilted. Take off the heat. 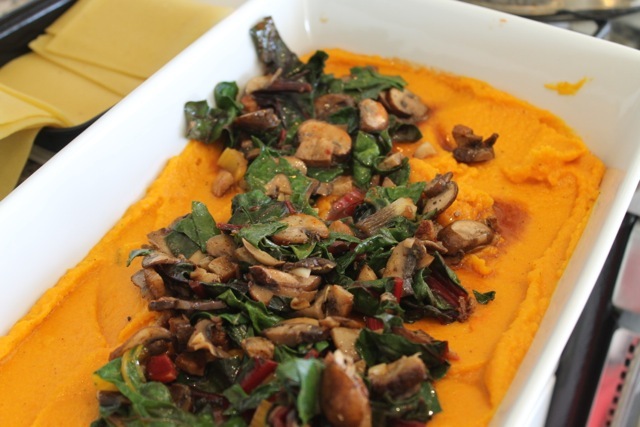 Creamy squash purée with the chard/mushroom mix on top. But you can layer it how you wish. I coated the bottom of the pan with a little sauce, added a layer of noodles, topped with pumpkin/squash, chard, more sauce then another noodle layer. Add a layer of ricotta, more noodles, then chard, then pumpkin then the last layer of noodles. Cover with sauce. Add more ricotta to the top if you like. Bake at 350°F for 45 minutes or until heated through. Serves 10. This dish looks amazing. You are SERIOUSLY loving your new home and kitchen. Ha! And I can’t believe it’s May, either. You’re still missed here in LB. “Hi” to the hubby and generous head rubs to the four-legged cuties! Thank you! It’s really easy–you should try it! I miss you too. I’ll definitely pass on your hellos and please send our regards to The Big Guy. 😉 Hope to see you SOON! Oh my! I’ve gotta say that looks delicious, that’s a wow to gluten free & grain free pasta too! I’m amazed by the ingenuity of some companies, to think there’s a definite niche market out there just waiting to be filled too! Congrats again on all that lovely kitchen space and garden, look forward to seeing some posts on turnips and the like soon! I am too! I thought this Cappello’s stuff would turn out yucky, but it actually tastes delicious. And a 45-second cooking time for fettuccine? Yes please! I’ll definitely do a garden post soon, as lots is happening in the garden. Thanks for the note, my Antipodean friend! Vegetarian and gluten-free? I have to sneak in some pork belly to my brother from another mother else he may go into withdrawal (code bacon: stat!). Hee hee. 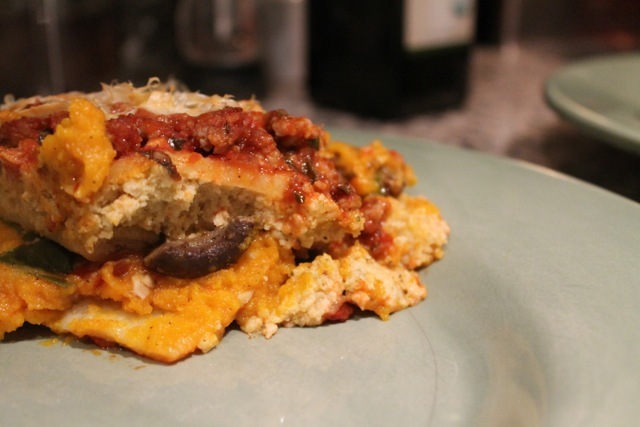 what a comfort pumpkin lasagne…. Oh my, running 18-23 miles a week. Girl you’re awesome. If I ran that much I could eat all of the things I bake! I see you’re loving the Santa Barbara lifestyle! i guess your lasagna cost me alot, 30 minutes in the threadmile for sa single portion…. Yeah, it’s not a low cal meal, but it’s rich so you won’t eat too much. Well, I can’t promise that!